Use chocolate bars that can be broken into segments. Lego blocks (or similar building blocks) can be used to teach not only fractions, but multiplication as well! 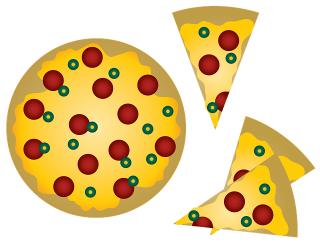 Use tangible examples, such as slices of pizza or pie. Children’s modeling clay or dough can be used to demonstrate splitting a whole into parts. Inexpensive paper plates are another great option. White plates can be drawn or colored, or already-colored plates can be cut into sections. Clear plastic cups can be marked with measurements. Using water, students can combine different fractions to learn about addition. Use smallÂ pieces of colored candy such as Skittles or M&Ms to allow students to calculate the fraction that represents each color in their pile. Teaching clocks are also a great way to give perspective on fractions.